Oct 9th 1839 Included in GP and Finance Committee report as to Watch Office Lock-ups surrendered to Sir C. Shaw. However Sir C Shaw decides ‘unsuitable for his purpose and the lease to be let go’. 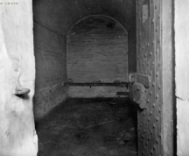 Mar 16th 1843 To examine the formerly used Lock up at Knott Mill and fit up the same as a lock up. April 6th 1843 To effect the alterations required. May 4th 1843 Now operational. 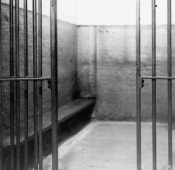 Feb 22nd 1848 HM Inspector’s report for Sec of State Home Dept into improvements requested to Lock-up accommodations – strong pane of glass to be inserted in the cell shutters being closed in cold weather without the cells being made dark. Sept 4th 1856 Mr Goodwin owner of the Lock-up to lease 4 cottages and a slaughterhouse at £55 p.a. for 28yrs and WC to make necessary alterations. Sept 22nd 1859 Necessary ventilation to 2 cottages required. Oct 17th 1867 Following the death of Sgt Brett in the ‘Fenian Outrage’ the LUSC ordered to make arrangements to secure the stations by:- Plating the doors in iron, wrought iron bars to windows, iron gate to entrance passage (see above photo taken before 1892 presumably). March 7th 1872 Repair to cottages. 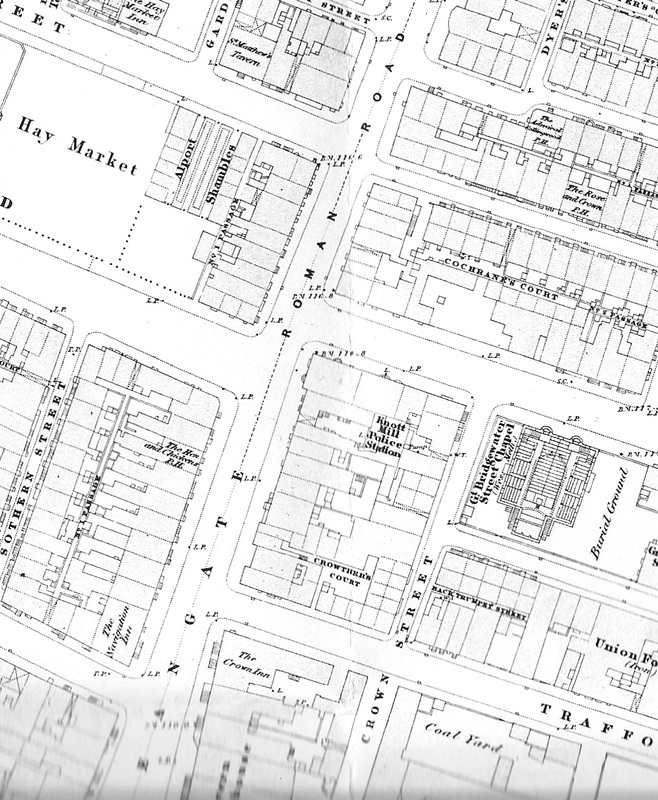 Jan 14th 1892 As part of the recent increase in the boundaries of the A Division to include Goulden Street PS in the North east and Hulme to the south a request was made 'for a station in the area of Knott Mill to help time taken to convey prisoners to Albert Street and reduce injuries'. 25th Aug 1892 Request for the use of the ‘Deansgate PS yard for the drilling of Post Office messenger boys. It was the Post Master general’s view ‘for effecting improvement in the appearance and deportment of the telegraph messengers’. This request would indicate the old premises still stood (operational or not) prior to the opening of Bridgewater Street PS on the south side in 1893. What is not clear is why Knott Mill PS closed at least four years before the site was overrun by the G.N.R.Co. extension other than general unsuitability albeit a clear operational need for a station was evidenced. 1899 Caminada’s report details the previous sale of ‘the old Knott Mill PS which was rarely used’ to the Great Northern Railway Co in his critic of the money spent on the Bridgewater Street north side station in 1898. 2012 Railway arches now demolished.